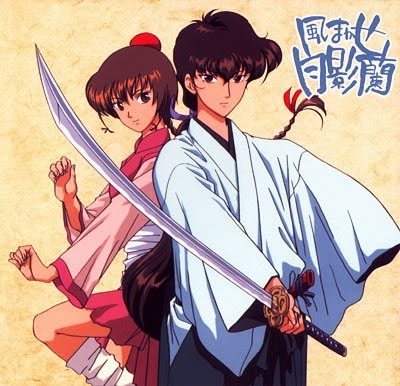 “Carried by the Wind: Tsukikage Ran” is one of the few flighty light hearted animes as the name suggests. It is set in the time of the Samurais and tells the tale of two women adventurers – Ran and Meow. Both have contrasting personalities. Ran is cool, composed and seldom perturbed. Meow on the other hand is immature and gets easily excited. The series has just thirteen episodes and each episode is a standalone adventure. The characters are fun. Ran is lazy and fond of drinking. Meow goes into flights of fantasy. Most of the adventures are interesting and not too dark as such. One can just sit back and enjoy the stories consisting of humorous situations without stressing one’s brains too much. The title song is also very pleasant and reinforces this kind of mood. It is one of the series where I used to listen to the complete title song before every episode. One interesting aspect I found about this series is the historic context. The series is set in medieval Japan and we get some insights into the life, the social structure and the problems people faced in those times. Some of the situations however are purely fictional but the flavor of real history is definitely there. For example the Samurai ethic, behavior and way of life are close to reality. However it is doubtful if there were any female Samurai like Ran during those times as women in those times were mostly confined to their homes. The other interesting aspect is the idea of two women adventurers in a patriarchal culture like Japan that was more so in the times the story is set. That way it is a strongly feminist theme that reinforces some of the things feminists believe in – independent women, who are not bound by social stereotypes. Women who live their lives queen style – each in her own way – Ran in a more masculine kind of way and Meow in a more feminine kind of way. This anime is one of those that come closest to the Western cartoons as it is light and episodic. I hardly know of any cartoons of Disney or Cartoon Network that consists of just one single story told over multiple episodes. Many of the Japanese cartoons however are that way – that makes them intense and forces one to sit through and watch all 50-100 episodes back to back which can take a great toll on one’s time. This on the other hand is something you can watch any time picking a random episode. So that way I would recommend this for one for people who are fond of American style Cartoons. You should watch 1-2 episodes. This is generally a fun series too. Seen the movie. It is a good one. Japanese culture is very fascinating. Yeah - you can randomly watch 1-2 episodes. Thanks Uma. I am slowly shifting to my real name as people don't trust your credibility if you are anonymous.